Citation: Pedro Carneiro de Sousa, Joana Borges da Costa, Delfim Duarte, Nuno Trigueiros. Vestibular paroxysmia: A diagnosis not to forget J Otolaryngol 2018;8(2):26-27. Vertigo and dizziness are common complaints among general population, with a lifetime prevalence of around 30% . Benign paroxysmal positional vertigo (BPPV) is the most frequent cause of acute episodic vestibular symptoms, followed by vestibular migraine . Vestibular paroxysmia is a very rare cause of vertigo, accounting for nearly 3%-4% of cases diagnosed per year. It is characterized by brief attacks of spinning or non-spinning vertigo which lasts from seconds to few minutes, with or without ear symptoms . A 74-years-old female patient presented with chronic complaints of episodic vertigo induced by cephalic movements, accompanied by backward disequilibrium and without hypoacusia or tinnitus. Previous treatment with oral betahistine in the former 3 months had no effect. On exam, otoscopy, acumetry, evaluation of nystagmus, head-impulse test, Dix- Hallpike and McClure-Pagnini manoeuvres, Romberg and Unterberger tests were normal. Audiometry revealed symmetrical hearing loss, which was mild, sensorineural and more pronounced in higher frequencies (Figure 1). 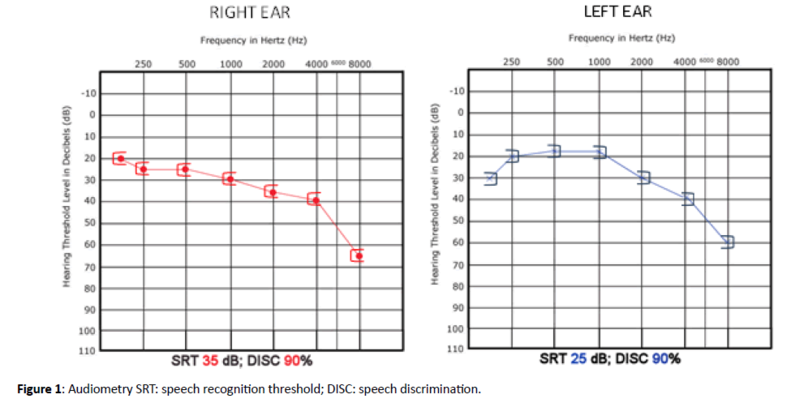 Figure 1: Audiometry SRT: speech recognition threshold; DISC: speech discrimination. Magnetic resonance imaging of brain and internal auditory canals showed a vascular loop in the right anterior inferior cerebellar artery insinuating into the right internal auditory canal. Diagnosis of vestibular paroxysmia was assumed and the patient began treatment with carbamazepine: 100 mg orally 2 times a day. At office evaluation after 2 weeks, all the symptoms had disappeared. Dosage of carbamazepine was maintained and the patient remained asymptomatic along time (Figure 2). Figure 2: Magnetic resonance showing vascular loop in the right anterior inferior cerebellar artery insinuating into the right internal auditory canal (white circumference). Vestibular paroxysmia is the name given to the syndrome caused by vascular compression of the vestibulocochlear nerve. Chronic external pressure on this nerve from an adjacent blood vessel is thought to lead to demyelination, decreasing its firing threshold and making the nerve susceptible to excessive stimulation and causing vertigo attacks . It is a vestibular episodic disease presenting great variability in the number of attacks between patients. However, the type of vertigo (spinning or non-spinning) and the number of attacks per day are very constant intra individually. These attacks typically last less than one minute . Many patients develop nystagmus with hyperventilation (and, therefore, with exercise), because it lead to transient changes in conductivity across the demyelinated portion of the vestibulocochlear nerve causing ephaptic discharges . Cephalic movements and certain head positions can also trigger vertigo attacks, as they increase neurovascular contact. Clinical professionals should exclude more frequent conditions such as BPPV, vestibular migraine, superior semicircular canal dehiscence (with symptoms typically triggered by Valsalva manoeuvre or louder sounds–Tulio’s phenomenon) or cerebrovascular disease. The positive response to antiepileptics, as showed in the clinical case, plays also an important role in the diagnosis. In fact, even low dosages of carbamazepine (200-600 mg per day) or oxcarbazepine (300-900 mg per day) seem to be effective. These drugs act as blockers of the transmembrane fast sodium channels, thus reducing neuronal excitability. Only in cases refractory to medical treatment, surgical microvascular descompression should be considered . This syndrome can also manifest in children who present with the frequent short episodes of vertigo, potencially confounding with benign paroxysmal vertigo of childhood. The neurovascular cross-compression syndrome may resolve spontaneously since vascular brain and bone structures grow at different speeds or be easily treated with low dosages of carbamazepine [3,7]. In spite of being a very unusual condition, vestibular paroxysmia should be considered in cases of episodic vertigo. Making this diagnosis correctly allows to treat accurately some vertigo scenarios that otherwise would be very tough to manage. Strupp M, Brandt T. Current treatment of vestibular, ocular motor disorders and nystagmus. Ther Adv Neurol Disord. 2009; 2:223-39. Seemungal B, Kaski D, Lopez-Escamez JA. Early Diagnosis and Management of Acute Vertigo from Vestibular Migraine and Ménière's Disease. Neurol Clin. 2015; 33:619-28. Brandt T, Strupp M, Dieterich M. Vestibular paroxysmia: A treatable neurovascular cross-compression syndrome. J Neurol. 2015; 263:S90-6. Ward BK, Gold DR. Tinnitus, Oscillopsia, and Hyperventilation-Induced Nystagmus: Vestibular Paroxysmia. Open J Clin Med Case Rep. 2016; 2pii:1100. Strupp M, Lopez-Escamez JA, Kim JS, et al. Vestibular paroxysmia: Diagnostic criteria. J Vestib Res. 2016; 26:409-15. Choi SY, Choi JH, Choi KD. The nystagmus of vestibular paroxysmia. J Neurol. 2018. Lehnen N, Langhagen T, Heinen F, et al. Vestibular paroxysmia in children: A treatable cause of short vertigo attacks. Dev Med Child Neurol. 2015; 57:393-96.